Reaping the benefits of apple cider vinegar for your hair is a little more complicated than upending a bottle of it over your head during a shower. Apply once a week for salon-worthy results. Apple cider vinegar (ACV) has a bit of a rep on the internet—you can use it as a skin tonic, a natural household cleaner, digestion regulator, and even as a potential weight loss aid. It’s the ultimate does-it-all ingredient, and even if you don’t need it in the kitchen there’s another good reason to stock up: apple cider vinegar can be an elixir for your hair. “Apple cider vinegar is one of the best cleansing and balancing treatments for hair,” says NYC celebrity hairstylist Netty Jordan. It’s all thanks to its acidic nature that helps apple cider vinegar exfoliate dry flakes from your scalp, remove residue, and boost shine, says board-certified dermatologist Anna Guanche, MD. Reaping the benefits of apple cider vinegar for your hair is a little more complicated than upending a bottle of it over your head during a shower. Here, experts share the best ways to use it along with some recommended products. Why does your scalp’s pH matter, anyway? According to a past study in the International Journal of Trichology the higher alkaline pH a shampoo has, the higher your scalp pH will be, which means your hair is more likely to suffer from cuticle damage, frizz, and a dry, irritated scalp. The acidity in apple cider vinegar counteracts alkaline pH, helping to improve your scalp’s health. To rebalance your scalp’s pH, check out the dp HUE Apple Cider Vinegar Salt Scrub, recommends Debra Jaliman, MD, board-certified NYC dermatologist, assistant professor of Dermatology at Icahn School of Medicine at Mount Sinai and author of Skin Rules: Trade Secrets from a Top New York Dermatologist. “This scrub will help gently exfoliate the scalp, which in turn will promote hair growth and healthier hair,” says Dr. Jaliman, noting that the scrub’s other ingredients—Himalayan sea salt, olive oil, and antioxidants such as vitamin E and polyphenols—are all nourishing and beneficial for your hair. Anyone with curly hair knows that it can be a bit of a challenge, forming perfect ringlets one day and an inch-deep layer of frizz the next. Curly and natural hair tends to be very dry, and moisturizing products can weigh down strands. Apple cider vinegar rinses are super helpful for these hair types, says Jordan. “The apple cider vinegar will naturally remove buildup while infusing hair with hydration and sealing down the outer layer of the hair. This treatment won’t weigh down the neutral fibers like other conditioning masks,” she says. Giving your dehydrated strands relief—and restoring natural curl patterns—is easy. Start with washing your hair with a sulfate-free shampoo, says Jordan. Then, she recommends rinsing with a product that contains apple cider vinegar. You can use the tonic recipe above or Jordan’s pick, Pureology Vinegar Hair Rinse. Leave on for two to three minutes, then rinse and condition for clean, shiny hair. Thanks to its antibacterial and antifungal qualities, apple cider vinegar can help if you’re plagued by dandruff, a scalp buildup that occurs when there’s too much yeast present on oily skin, says Dr. Jaliman. Use Featherman’s DIY apple cider vinegar rinse to avoid dandruff. Fischer also recommends John Masters Organics Herbal Cider Hair Clarifier & Color Sealer. We all want that shampoo commercial hair—voluminous, frizz-free, and full of sheen. Applying apple cider vinegar smooths down the hair shaft's cuticle, says Dr. Guanche. The result? Shiny, smooth hair without the frizz and roughness. Fischer recommends doing an apple cider vinegar treatment rinse every Sunday to prep your hair for the week ahead. Mix one-third cup apple cider vinegar with two cups of water. Combine with a bit of shampoo for your first wash, then rinse and condition as usual. 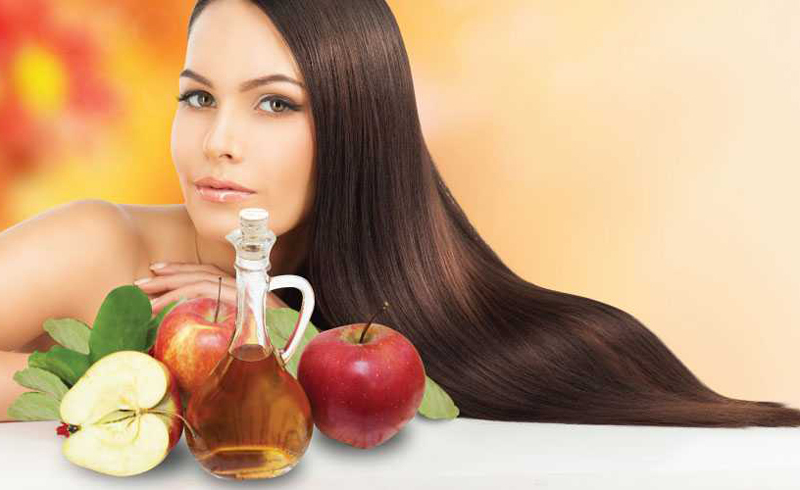 Is apple cider vinegar helpful for hair loss? Dr. Jaliman thinks so, since ACV is so very beneficial to the composition of your scalp. “A healthy scalp is key to keeping hair healthy and preventing hair loss. Apple cider vinegar will help keep your scalp protected by warding off bacteria and keeping a balanced pH level,” she says. For scalp health, Dr. Jaliman recommends mixing three to four tablespoons of apple cider vinegar with one cup of water in a spray bottle. Apply it to the scalp and massage in, letting the mixture sit for 10 to 15 minutes before shampooing. “Massaging will help increase circulation and stimulate hair growth,” Dr. Jaliman says.